A wage garnishment occurs when a judgment creditor sends a wage garnishment order to your employer requiring your employer to withhold a certain percentage of your wages and remit that percentage to the judgment creditor. Usually, before a creditor can garnish your wages they must get a judgment from the court. Once they have a judgment (meaning they have sued you and won) they can send a wage garnishment order to your employer. Once your employer has received the wage garnishment order they will have to withhold a certain percentage from your paycheck (often 25%) and send that money to your judgment creditor until the entire judgment has been satisfied. Bankruptcy can stop a wage garnishment immediately. When you file chapter 7 or chapter 13 bankruptcy the automatic stay comes into effect on the day of filing. The automatic stay acts as an injunction against ongoing collection efforts and stops collection lawsuits, repossessions, foreclosures, and wage garnishments. Therefore, filing bankruptcy on Tuesday will stop the garnishment of your wages on Wednesday. If the underlying debt is unsecured dischargeable debt then you should also be able to discharge (eliminate) the debt in chapter 7 bankruptcy and thereby stop the ability of the judgment creditor from collecting on that debt ever again, including through a wage garnishment. To stop your wage garnishment through bankruptcy contact our bankruptcy attorney at (916) 596-1018. The bankruptcy attorney may be able to stop your wage garnishment immediately through an emergency bankruptcy filing. Don’t Want To File Bankruptcy? Learn How To Stop Or Reduce A Wage Garnishment. How Much Does A Sacramento Bankruptcy Attorney Cost? This testimonial or endorsement does not constitute a guarantee, warranty, or prediction regarding the outcome of your legal matter. We are a debt relief agency. We help people file for bankruptcy relief under the U.S. Bankruptcy Code. The information contained in this website is for informational purposes only and is not legal advice. An attorney-client relationship can only be established by signing a representation agreement. 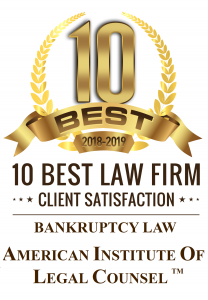 *$900 Chapter 7 Bankruptcy Fee Disclaimer: While most cases qualify for the above fee, some cases are complex. Consequently, the above fee is only a sample fee (not a specific or guaranteed fee) and is subject to change at any time due to the necessity of charging more for complex cases.